Thank you for reviewing this webpage! For new comers, "GUTH Venus" is a fairly recent and relatively small discovery site area which apparently only I (backed by several witnesses) have been able to identify from within the original NASA/Magellan image library. Clearly this is a fairly grand discovery that has somehow been long overlooked by NASA, at the very least by 10 years. This document is now fairly old, as other pages have since been included in this URL. 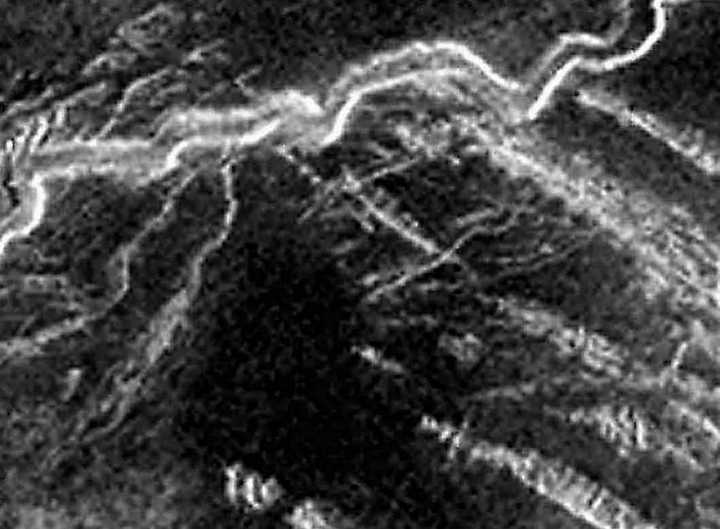 For the past several months (8+), I have been attempting to communicate with, inform and update NASA with regard to this worthy discovery, as being that of significant structures and infrastructure and therefore the greatest probable existence of - LIFE - on Venus. So far, this NASA approach has been disappointing to say the least. 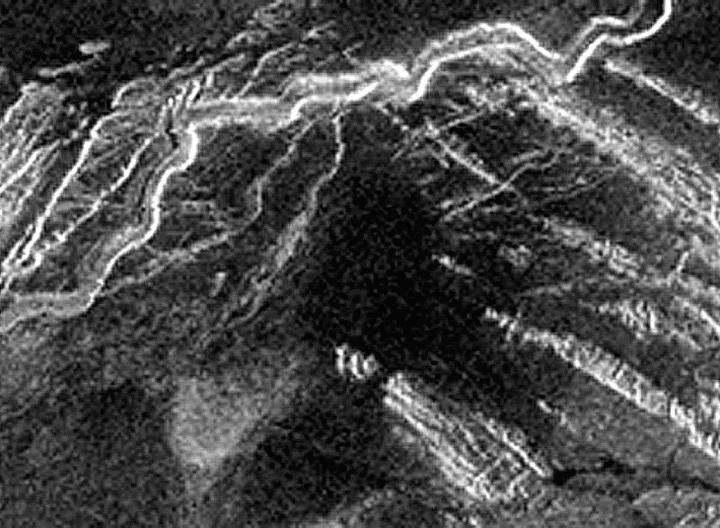 The official NASA/Magellan image (upon applying my relatively low cost conventional software enlargements) clearly reinforces identifiable structural elements as well as considerable infrastructure, as so arranged and so totally unlike other areas on Venus as well as that of such yet to be discovered elsewhere. This is not even a complex guess or a chance encounter, as I have viewed and also enlarged and studied nearly a hundred other considerations (other sites) on Venus, where I in fact do see all the common so called lava-flows, erosions and rock formations, but however, not anywhere to this degree of complex structural looking elements, so this "GUTH Venus" discovery is not purely any guess, not by any long-shot, so I suggest that you get over your denials, as this is the real thing, and I believe that I as well as others can most easily prove just that. At the time of the original NASA/Magellan image releases to the public, the privately held affordable photo enhancement/enlargement software solutions was essentially limited (otherwise mostly held by only leading researchers such as those employed by NASA). And even later on, by the time these original images were all being put to bed (in the early 90's), NASA had already staunchly proclaimed and documented that Venus was and had been for perhaps millions of years, a thoroughly dead planet, and therefore no specific research or studies let alone any further financial resources were ever slated for continued exploitation or even that of detailed visual exploration of these Magellan images. Case closed! (at least that is perhaps how NASA would have liked it kept). Sorry folks, apparently this discovery is all my fault. My message(s) to NASA was never about what us average educated humans might expect to find on Venus, but what is now most likely and highly possible for that of other species having long since adapted to their environments and otherwise clearly survived on Venus, through evolution plus advanced (perhaps unfamiliar to Earth) technologies, just as we have adapted to our most extremes here on Earth plus expanded via our technologies so that us mere humans may survive comfortably while surrounded by environmental extremes of temperatures and pressures as from miles above our surface into the vacuum of space and then also miles below our surface (miles under water as in submarines). Those surviving on Venus could have and must have accomplished similar capabilities towards their ultimate survival, just as here on Earth, where many Earthly species live within extremely narrow parameters, while others (such as humans utilizing technology) achieved a much wider capability, like so many other creatures (since the dawn of mankind) obviously have adapted far beyond their original status in order to survive in spite of changing environments and some even from the impact of mankind, unfortunately, many species (perhaps more deserving then us humans) have not been so lucky, and have since died off, and if we wait around long enough (say another 10 years or so), those remaining on Venus may needlessly perish as well, and perhaps that's why NASA is waiting. Within the image/area of "GUTH Venus" are to be found several intelligently configured structures with a relatively complex surrounding lattice which clearly indicates that some form of intentional facilities development has emerged, and may even be active at this time. There are several terrain issues at this location further supporting such an incorporated arrangement of structures including underground access (such as extreme elevation). There is a strong indication of a structured airfield (a massive raised platform structure) supporting logical sub-bay features as would be essential for equipment surviving the long (2900 hr. Venus day). 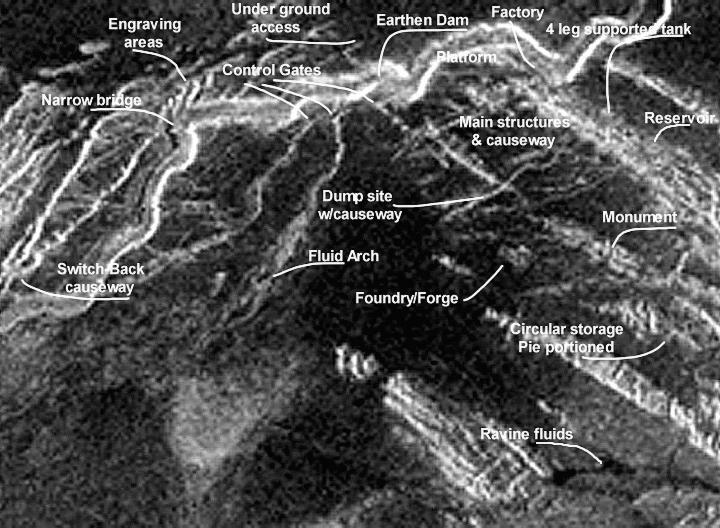 I have identified parabolic shapes and potential observation capabilities as being extremely large structures situated at either end of a main causeway, plus identifying that of many other potential underground access attributes. The upper East side of the main (so called) lava flow channel shows a major switch-back causeway having significant hillside reliefs, and then also narrow bridge feature as forming a continuation of that roadway, off the upper right termination of that mountain range circumventing road. I have further identified what looks to be a monument, additional storage capabilities, plus an enormous passive volcanic crater or vent (quite possibly being utilized as a trash/dump sight) having it's own causeway, and then nearby what could be an incinerator or forge/foundry, plus also, a bit further to the SW is a substantial arch feature (most likely some form of a fluid formed arch), as you can see by the secondary channel flow seems to be feeding this substantial arch, and also viewing the associated erosion plus to be considering the extremely steep drop off in elevation to the point where this arch begins, all of this is highly suggesting that fluid is the responsible cause of erosion and not that of purely lava flows. The possible second location; I truly believe that there should be another compound (life supporting community) installation similar in capability and function, located 180 degrees (half way around the planet and as equally elevated), situated so as their sun rises at "GUTH Venus" and begins super-heating the area, families and unessential crew would be relocated to their alternate facilities (perhaps GUTH-II Venus) where it has just turned dark for the next 120+ Earth days (2,900 hrs). This seems like a good idea to me, and it makes a lot more sense over NASA's blatant and pathetic denials. In my quest for answers to so many questions, plus fair and open minded review of my findings with regard to Venus; besides always supplying my e-mail address, I've offered my full mailing address as well as a real phone number along with my real name. Unlike most others I have contacted having chosen to use aliases and otherwise not offer any phone numbers, which only leads me to believe these individuals are not what they appear to be, not truly independent researchers but most likely operating as NASA moles, demonstrating their intent and mission of suppressing facts and otherwise controlling media, if necessary by feeding others, including myself, whatever misinformation and/or simply obstructing further access of information and thereby stalling any new discoveries that might just be a little embarrassing to NASA. In support of my belief that something is terribly wrong with regard to NASA's responses; I have received nearly identical (scripted) replies to nearly every inquiry, as essentially stating the same exact wording to the effect that what I'm seeing is "lava flow, erosion and rock formations as commonly to be found elsewhere on Venus"... Now,,, however, when I have replied asking for such documentation/images, as those regarding other such areas on Venus or for that matter from that of any NASA imaging taken of any other planet, moon and even including Earth as offering anything remotely similar in the way of such naturally formed elements so collected and arranged as those I have discovered within "GUTH Venus", will, it seems the line goes dead (no further response). Just maybe NASA lost all of those images, probably in that same black hole they apparently lost all of those original Apollo negatives and footage of those lunar lander test flights. Therefore, and because I can not seem to acquire those "NASA point of view" images (not one), perhaps you and I should believe we are all being intentionally put off and/or mislead by NASA as well as by their highly entrenched mole populations.. One might think good public relations and/or the perception of such should be highly valued by NASA, because, nearly all of it's funding is somewhat based upon public (taxpayer) as well as foreign and various military support along with perceptions that all or at least most of these investments are being wisely managed, although, we must recall that our cold war with the USSR was highly dependent upon perceptions, and that we are in fact quite good at that, and perhaps NASA may some day become known as truly the king of all perception masters. I have come to believe that somehow NASA simply overlooked this exceptional find on Venus, most likely because they were never truly looking for anything in the first place, and if this be the case it would certainly be a most highly damaging and a wide sweeping departmental embarrassment issue (with the only possible exception of perhaps those not-so-well documented nor photographed Apollo landings, however, after 30 some odd years, I believe the jury is still out on this one; As from what evidence I've seen, surely I can't prove we ever did or not accomplish what NASA states). Until recently, I was under the impression that NASA was charged first of all with the necessary research and foremost the landing on our moon, and next to further explore our solar system, and only then everything else that could some day offer value to humanity (besides providing Star-Trek computer users great wallpaper or that of offering our military and NSA strategic cold-war as well as superior preemptive advantages). Now however, I have become somewhat influenced and concerned by what has been written and recently sated with regard to NSA/NASA/CIA/DoD and related agencies, from those reporting upon and suggesting some rather sinister agendas including that of fairly significant cover-up's or at least that of timely information withholding over sufficient time so that all those involved are either quite dead or simply too sickly or perhaps thoroughly scared to ever be questioned and possibly held accountable. Some of my latest questions (besides just Venus specific issues) are these: Why has it been so difficult over the past several months to simply contact those most capable of exploiting this Venus opportunity ?, Is nearly every NASA researcher shallow and so insecure that they are unable to accept anything new from an outsider ?, Why is it so difficult to simply support a belief that a race of intelligent souls constructed something and live(d) on Venus ?, Why has NASA been so intent upon squelching this discovery or otherwise so outright blind ?, What might the best NASA support work-around be ? Will NASA even permit you or others to assist an outsider in order to answer these and several technical research questions ? and, where otherwise is the back door to the real brains of true (non-NSA/CIA/DoD agenda) space research ?. I would have thought looking closely at our nearest two planets was far more then just gathering pretty photos, furthermore, and that interpreting these extremely costly images was what NASA as well as privet research was all about. Anymore, I am beginning to think not, if only to be judging by those NASA moles at their official uplink.space.com and their highly regimented/orchestrated negative (idea bashing) basically anti-support logic. As I no longer believe there is anything further to be gained, as far as that which needs be offered or shared with some of these sources. I am however, still looking forward to working with true (open minded) researchers and honest space explorers. Hope I'm not being all that disrespectful, but sorry NASA, if this report of mine is not up to your fine upstanding "non-disclosure" standards. Over time, and on my own I believe I'm improving, and I'll gladly accept any suggestions or even consider complete re-writes if only to better inform the world of this truly remarkable discovery.